Braden Boucek serves as Director of Litigation at the Beacon Center of Tennessee. He manages in-house legal matters and litigation for the Beacon Center, working to advance Beacon’s larger goal of promoting freedom and opportunity in Tennessee. Braden looks for potential cases and areas that are ripe for potential litigation. He then handles the litigation of any case, from filing the complaint through any appeal. He also addresses any legal issues that Beacon handles in house, and manages any that are contracted to outside law firms. Braden has a nearly 14-year career litigating both trials and appeals in state and federal court. Previously, Braden was an Assistant U.S. Attorney in both Nashville and Memphis for over nine years. During that time, he handled hundreds of cases ranging from Organized Crime, Drug Trafficking, Fraud, Counterfeiting, Terrorism and Immigration offenses. Braden has been recognized by his office for performance, winning both the Special Achievement award and Distinguished Service award. Two of his investigations were recognized as the district’s “Case of the Year” by the Department of Justice’s Organized Crime and Drug Enforcement Task Force. 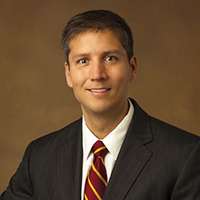 For nearly five years before joining the Department of Justice, Braden served as a prosecutor for the State of Tennessee, first as an Assistant Attorney General and later as an Assistant District Attorney. He has been lead counsel in many jury trials at both the state and federal level. He has also argued dozens of cases before state and federal appellate courts, including the Tennessee Supreme Court and Sixth Circuit Court of Appeals. Braden also served as an extern for the Florida Supreme Court. He obtained his J.D. at Florida State University College of Law, and his B.A. at the University of Richmond.